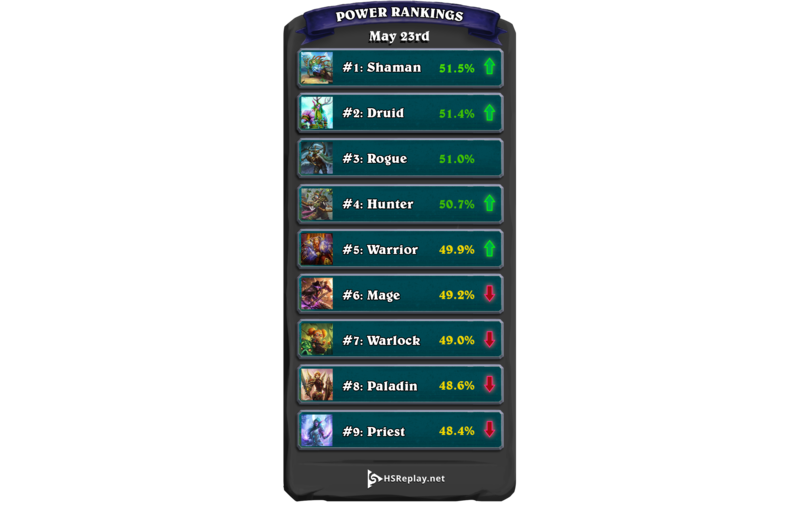 Here's a look at the class power rankings right now when looking at games from Rank 4 to Legend. Outside of Druid, we've seen a complete reversal with Paladin, Warlock, and Priest plummeting to the bottom. No surprise Paladin and Warlock took a huge hit because the nerfs, but Druid has been able to maintain a strong spot because of the power of Token Druid and even Taunt Druid. Even Shaman has been solid for weeks, but now it finally has the opportunity to shine as a Tier 1 deck. Hunter has followed Shaman up the ranks with Spell Hunter having a lot of success so far. Overall, the win rates are very close in this first day with just a 3.1% spread between first and last, which means all the classes have decks that are performing well. 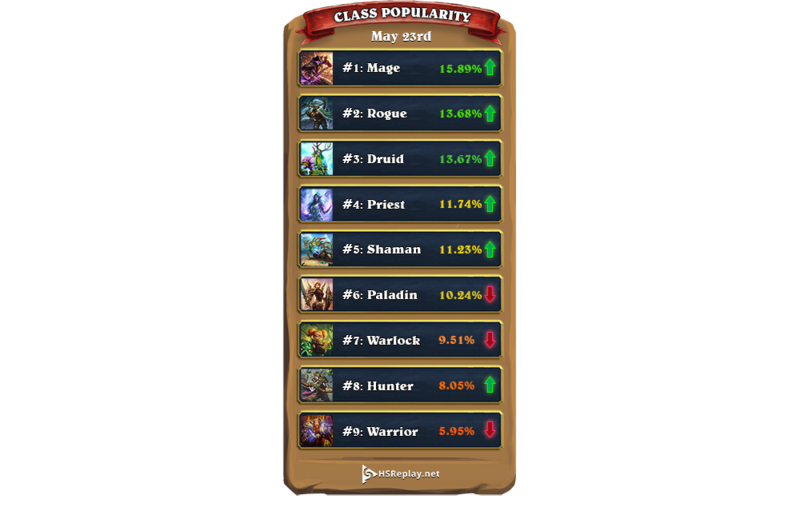 Here are the rankings according to class popularity when looking at games from Rank 4 to Legend. Although Even Shaman is winning the most, we've seen the player base start the new meta with a lot of Tempo Mage and a combination of Odd Rogue and Miracle Rogue. Hunter right now is showing the biggest discrepancy between win rate and popularity. That will likely change very soon if Spell Hunter continues to win at it's current rate. Here are the Top 5 performing decks in various classes with at least 500 games in Rank 4 to Legend in the last 24 hours. Token Druid (61.7%): We've seen this deck at times in events, but it's never been able to usurp the Paladin and Warlock decks consistently on ladder until now. This deck relies on big mid-game plays like Wispering Woods into Soul of the Forest to setup huge Savage Roar and Branching Paths finishes. Continuing to prove that Spell Hunter does not need Barnes and Y'Shaarj, this deck has a great balance of control with good removal and Deathstalker Rexxar to finish with huge mid-game plays like Lesser Emerald Spellstone and To My Side!. Build-A-Beast also got an upgrade in this expansion with more Poisonous and Rush cards being added to the beast pool. Even Shaman (57.5%): There are a lot of different variations of Even Shaman right now which are all doing well, but this one just happens to be the best one. New cards like Murkspark Eel, Vicious Scalehide, and Earthen Might are quite effective early in this deck to fight off any early pressure. This allows you to transition into a legendary finish. This deck plays almost all of the Shaman legendary cards with a lot of 2 card combos. It's not cheap but if you can afford it, it's super fun and effective. Odd Rogue (57.2%): This deck hasn't changed too much in the last couple weeks. It is still one of the best aggro decks because of it's pressure and explosiveness. Big Spell Mage (56.8%): This archetype has continued to evolve over time. We still have the full array of Mage removal cards mixed with some new value cards like Arcane Keysmith, Stonehill Defender, and Sindragosa. With Frost Lich Jaina always a force at the end of games, this deck continues to be one of the best control decks in the meta. Check out the full list of top decks HERE. We always hope that balance changes will shake up the meta and it looks like Blizzard has been able to accomplish that so far with Patch 11.1.1. Try some of these decks out and let us know on Twitter how you do with them!